What Kathy Hoffman will do as Superintendent of Public Instruction? At the same Coffee Bean in Glendale where we first interviewed her in early April, Democratic Nominee for Superintendent of Public Instruction Kathy Hoffman (dressed in red in support of the Red for Ed movement) relayed what she would do for public schools as Superintendent if she wins over her Republican opponent in the November 6 elections. If victorious, she will make immediate plans to get to know the people who work in the Department of Education. One of her first acts as Superintendent would be to conduct a thorough financial audit to see how the funds have been disbursed to all stakeholders inside and outside the Department. A Clean Elections Candidate, she has already moved to develop relationships with the County Superintendents of Education. After her impressive win over noted public servant David Schipara in the August 28 primary election, Ms. Hoffman and her growing campaign team (which will include former Schipara volunteers) has immediately launched a campaign to win the election in November and transition to taking charge of the Department of Education in November. Publicly advocating a Governor David Garcia’s program for fully funding public schools through sustainable revenue sources. Reducing the teacher shortage by offering teachers comprehensive benefits packages, which include paid parental leave, we may be able to make the profession more attractive. Another component of retention would be to reduce class size and offer aides when available to cut teacher workload. Promoting ethnic studies for various cultures like Native American and Hispanic to enroll in. Championing full-day Pre K and Kindergarten. Embracing career pathways and apprenticeship programs along with early college opportunities for high school students. She feels these programs have the best chance to secure wide bipartisan support. Increasing funding and reform the testing/exiting process for ELL and special needs students. She would work to repeal the English Only Statute. Furthermore, she would revisit former Superintendent Horne’s ELL exit guidelines so ELL students are better prepared for English. She would also revise the antiquated special education state assessments, looking at other state assessments for ideas. Partnering with utility companies to expand and improve broadband in schools (including community colleges,) especially in our rural communities. Providing meals for students whose families are not Title One but still could not afford to feed their children. Saying no child should go hungry, she advocates healthy meals for kids, proposing that children take food education and cooking classes so they can appreciate the healthier dishes. Gradually phasing out the AZ Merit exam. She believes that the test, where results are not available until after the school year is over, is a logistical nightmare, especially when schools periodically encounter issues with Internet crashes during testing. She favors students taking either the college entrance SAT or ACT with high school juniors that do not take either one of those taking the AZ Merit. She would also recommend that high performing schools no longer receive funding for their high test scores because she believes other factors (demographics and residency) contribute to those results. Supporting reforms for charter schools that include the election of independent board members, a halting of nepotism in contracting, greater transparency, and “preventive” procedures that would provide for schools that close after the one hundreth day. Mandating that existing vouchers, after the hopeful defeat of Proposition 305, more transparent and accountability (especially with where the funds are going). She wants the existing vouchers, except for special needs children to be gradually phased out because she does not believe taxpayer dollars should go to private (in some cases) religious schools. Making schools safer by hiring more counselors, social workers, and school psychologists who can use preventive measures by identifying potential issues and develop behavior plans all relevant stakeholders participate in. She also wants children to take part in social and emotional development character-kindness classes at an early age that gradually transitions to life skills when they enroll in high school. She does not favor the arming of teachers and school resource officers should only be staffed according to school need. Having children enroll in an Active Citizenship-Service Learning class. Commenting that the forums and debates with David Schipara were instructive and made her a better and more informed candidate, Ms. Hoffman has moved to unite the Democrat Party behind her candidacy. Mr. Schipara has lent his endorsement and some of his volunteers will be joining Hoffman’s team. Together, they will travel the state canvassing for support from Democrats, Independents, and disaffected Republicans who fear their party has drifted too far to the right. 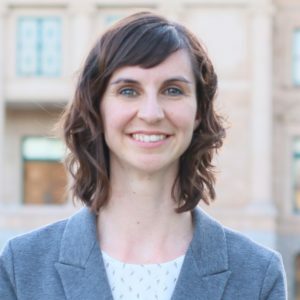 She believes that her background of being a public school teacher separates her from Frank Riggs, her Republican opponent. She also thinks that her support for Red for Ed, opposition to vouchers, and embrace of real science education (as opposed to the Creationism-Intelligent Design ideas that her Republican opponents embrace) also set her apart from the other side. For the last year and a half Ms. Hoffman, facing long odds, traveled to all parts of the state, working hard to connect with the people and convinced them that she was the best Democratic candidate to lead the Department of Education. An impressive candidate who wants to fully fund our public schools, give high-quality educational access to all students, and compensate our teachers, administrators, and staff what they deserve, all voters (Democrats, Independents, and Republicans) should strongly consider her candidacy as the next Superintendent. In contrast to her prospective Republican opponents, she, along with Gubernatorial David Garcia and the Democratic Legislative District candidates, offers the only progressive education program that will improve the standing of children and the state. For more information on Ms. Hoffman, please visit the below sites. Thanks for this, David. Very informative!